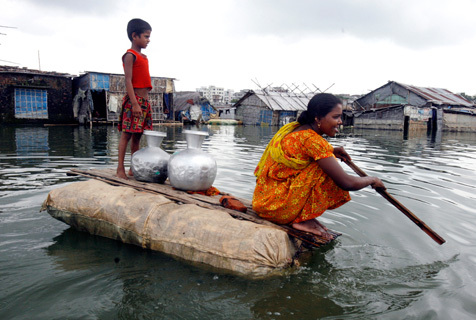 Bangladesh is expected to be one of the most climate affected countries in the developing world. The severity of climate change in Bangladesh includes increase of average weather temperature, extreme hot and cold spells, irregular rainfall, powerful cyclones and tornados and displacement of communities due to sea level rise and salt-water intrusion in arable lands (IPCC, 2007; Pender, 2008). In addition, several studies revealed that the adverse effect of climate change in Bangladesh is already being manifested through these extreme weather events, leading to large scale damage to crops, employment, livelihoods, and the national economy (Ali, 1999; Asaduzzaman et al., 1997; Choudhury et al., 2005; Chowdhury, 2007; Huq et al., 1999). The increasing pattern of weather change and natural hazards in the country in the recent decades has made many communities vulnerable to climate change impacts, especially since the majority of Bangladeshi population still depend on natural resources and agriculture for their livelihood and wellbeing (Atiq et al., 2007; CCC, 2008). Nonetheless, climate change is not a gender-neutral phenomenon. Evidence shows that, worldwide the impact of climate change affects women and men differently. According to Milne (2005), vulnerability due to “climate change is not gender, class or geo-politically neutral”(p.53). Structured unequal power relations, gender divisions of labour and feminization of poverty are together responsible for the gender differentiate climate change experiences. Within the total of 150 million population of the country about half are women (BBS, 2011) who contribute heavily to the country’s economy especially in the rural areas where livelihood is mainly dependent on agriculture. Furthermore, unequal social strata and pervasive gender disparity underpin the country’s status as a hot spot for climate change in terms of socio-economic vulnerability. In Bangladesh, climate change hence increases women’s socio economic vulnerability by directly impacting on their families’ traditional livelihoods. In the quest for new livelihoods, men migrate and women are left behind with the burden of household responsibilities. Women are always at risk of falling into more of a poverty trap due to male out migration. Unlike the men who can leave for the town, women and children cannot run away (Khaliq, 2009). According to Guhathakuraka (2003) the increase in female-headed households as the consequences of male out migration gives women the extra burden of taking care of children and household responsibilities alone (Rahman & Tait, 2003). Kartiki (2011) suggests that in Bangladesh women usually do not migrate independently. The male head of the households mostly takes decisions for migration and most vulnerable groups are not even empowered and equipped to migrate. This dynamics of gender power relation plays a vital role to determine vulnerabilities as well as different coping practices by men and women. IPCC’s Fourth Assessment Report (2007) also recognizes that gender role and relations shape this vulnerability and capacity to adapt to climate change. It especially mentions the vulnerability of rural women in developing countries, who are often dependent on natural resources for their livelihood, do most of the agricultural works, and bear the responsibility for collecting water and fuel. Climate change is widely predicted to affect all these areas of women’s lives adversely and in different ways from men. In the coastal areas of Bangladesh the scarcity of drinking water, a prominent consequence of climate change has increased women’s work burden significantly. Women have to travel far to collect water when both ground and surface waters are being inundated by salinity and it is a difficult task for them to carry drinkable water. The South West region of Bangladesh is one of the prime victim zones, where climate change has manifested through several effects such as salinity, waterlogging, floods and erratic rainfall. Shortages of drinking water, reduction of cash crops, loss of livelihoods and water logged lives are most common forms of climate change impact. As a consequence, women and children of these areas are affected adversely since they need to ensure food security and water consumption for the family (Neelormi & Ahmed, 2009). In Bangladesh Climate induced disasters has also gendered connotation. Several studies show that during disaster and post disaster period women become more vulnerable than men in terms of health, nutrition, personal safety, and household responsibilities and economic well being. The devastating cyclone of 1970 of Bangladesh proves that women and children as a risk group because during that destructive incident the major casualties happened for women and children. Action Aid Bangladesh (2008) claims that during and after disasters women and adolescent girls face major problems regarding their health issues due to the collapse of health and sanitation systems. They consequently suffer from urinary and reproductive health related diseases. Women’s physical security and dignity also might be at risk in the aftermath of disasters. Rashid and Michaud (2000) state that women in Bangladesh face more mental strain and bear the brunt of certain type of social and cultural constraints to sharing common spaces during disaster. Nasreen (2004) reveals that women and adolescent girls lose their privacy, are abused sexually in cyclone shelters and face harassment in relief queues. Moreover, due to responsibilities for elderly, children, disable members, and livestock assets women do not show willingness to move to cyclone shelters. While women’s vulnerability is a global phenomenon, there is also evidence that women’s dependency on the environment and certain types of gendered roles, experiences and knowledge offer significant potentials to the climate response, particularly in the rural context (Rocheleau, 1996). Several studies demonstrate that Bangladeshi women also practice their knowledge and experiences at the household levels to adjust and cope with climate change and disaster management (Dankelman, 2008; Nasreen, 2010; Paul, 1998). There is also evidence that women have increased their household safety and food security through their traditional knowledge and innovative practices to cope with the changing situation. On the other hand, male migration due to climate change impact offers a different dimension of women’s coping practices and survival strategies as a changing scenario of traditional gender norms and division of labour. Though traditional views consider women as the victims of disaster and climate change, and often overlook their role in response to the situation. Virtually, they have to perform their triple roles -productive, reproductive and community roles to cope with the situation. During and after a disaster women undertake the certain tasks directly related to survival for all family members, find out new livelihood option and also play role in community services. “Women are key to the prevention of disasters—their local knowledge is useful during and after disasters, they have survival and coping skills in emergencies, including food preservation; their physical and mental health care skills need to be harnessed during relief operations” (Srinivasan, 2010). So inclusion of women in the climate change adaptation programs as well as disaster management plans and programs can bring a positive result to handle the situation. Women can introduce innovative ideas from their practical coping strategies and experience in climate change adaptation and disaster management as the primary frontiers especially in household level. Hence, it is equally important and essential to involve and include women’s issue in relevant policies and programs for sustainability. Bangladesh Population and Housing Census, 2011 conducted by Bangladesh Bureau of Statistics (BBS) under the Ministry of Planning Bangladesh. This is the main national census conducts in every 10 year and one of the main recognized statistical data sources in the country. Religion and Education – More Harm Than Good?